Happy days. A match which many of us felt could trip United up, ended with Newcastle playing ‘keep ball’ for much of the second half. Why so comfortable? Bordeaux winning 4-0 against Club Brugge probably had us rating them a bit better than they proved to be but undoubtedly Pardew putting out a stronger line-up than so far in Europe paid dividends. Bordeaux actually had the better of the first fifteen minutes and had a couple of decent chances, maybe benefiting from starting with nine of the players who lined up for the visitors in their impressive win at Lyon at the weekend. Goals change matches though and an exquisite Cabaye crossfield ball set up Obertan one on one, in an unfamiliar left side role he outpaced the full-back before lashing a low ball across the goal no more than three or four yards from goal, Shola will never score an easier goal and maybe the keeper will feel he should have cut out the cross. This settled United down but the visitors were controlling the possession and forcing Newcastle back, Tiote is doing his usual 100 mile an hour chasing down in midfield and in the space of five minutes he gets booked for taking out one of the visitors before going down with a freak injury to his right ankle with no contact made with another player. 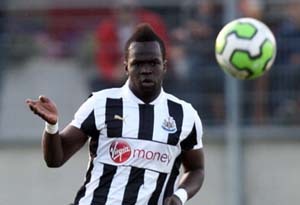 Cheick painfully limps off and thoughts turn to Sunday but happily/miraculously he jogs back on a minute later, phew! With half an hour gone the manager responds to Bordeaux’s control of the ball by moving from a 4-3-3 to 4-4-2 with Anita on the right and Obertan out left. The defence are holding out well under the pressure and Williamson amongst others gets a decent block in while Elliot deals with a long range effort. Match over five minutes before half-time as unbelievably Newcastle score from another cross! This time Simpson puts a decent ball in which the defender diverts past his keeper with Cisse lurking behind. Anita has a shot saved just before the whistle and it is a job well done so far. Harper replaces Elliot for presumably some unseen injury but at the other end it is a hat-trick as Shane Ferguson’s cross picks out a suspiciously looking Cisse who has a bit of luck he’s been missing as he scuffs it beyond the keeper. Presumably overcome by Newcastle scoring form three crosses in one match, a t-shirted (must be one of the shyer ones) streaker comes onto the pitch and has his fifteen seconds of fame. Credit to the French fans who seem to be enjoying themselves despite the scoreline, unlike their players. 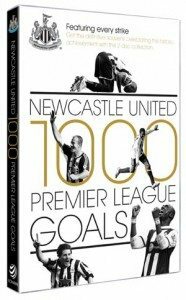 Predictably Newcastle then turn the heat down with the match won, Cabaye and Tiote are replaced by Bigirimana and Gosling, no doubt Cisse would also have been brought off if the keeper substitution hadn’t been necessary. Ex-Mackem David Bellion came on to half-hearted pantomime boos and could have given them a lifeline if it hadn’t been for harper’s boot deflecting his shot. Decent performances from just about everybody and little surprise we saw more from the fringe players, particularly Obertan, with the likes of Cabaye, Tiote and Cisse alongside. Good call from Alan Pardew tonight and a result that should set Newcastle up to comfortably qualify from the group, now bring on Man United. Subs Not Used: Santon, Ben Arfa, Sammy, Ba. If you can’t use your season ticket for Sunday’s match against Manchester United get it sold, or to buy some of the best tickets in the ground even when the box office is sold out, go to VIAGOGO.